Has your dishwasher rack given up the ghost? The coated wire racks generally develop problems long after the warranty has expired, but long before the machine itself wears out. Depending upon your brand and model, you could be looking at $100 or more for a new rack. You may be able to save some money – and your dishwasher rack – by trying one of these fixes for common rack issues. When the vinyl outer coating on the dish rack begins to wear away, the metal underneath is exposed to hot water and steam. This causes the metal to rust, which can transfer onto your dishes. You can fix rusted spots on your racks with a specialty rubber or silicone coating. Some products, such as ReRack, brush on to cover rusty areas while others, like Sugru, come in the form of a flexible putty that hardens over damaged spots. These products will bond to the rack’s surface, leaving it protected from further corrosion. If the tips of the tines in the rack become cracked or rusted, your dishes could suffer damage during a normal wash cycle. A repair kit, available at many hardware stores, can keep your dishes safe and prolong the life of your rack tines. These kits contain a bottle of vinyl repair paint along with rubber tips that slip over the ends of the tines. Simply smooth the tine surface and remove any rust with sandpaper or steel wool; then, apply the vinyl paint and slide on the replacement tip. Let it dry and your dishwasher rack is as good as new. Does your dishwasher rack slide out on its own as soon as you open the door? Each rack has a series of wheels or rollers that move within a track, allowing the rack to slide in and out. If the brackets holding the track in place are not secure, or if the wheels become damaged, the rack may not remain in place. In most cases, however, gravity is the cause of unwanted movement. The dishwasher may be tilted forward, and even a very small tilt can result in the racks rolling out when the door is opened. 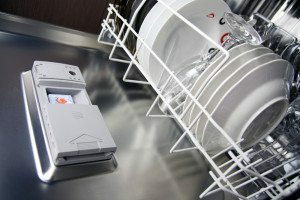 Take a look to see if the appliance is level. In many cases, pulling the machine out a bit or adjusting the feet can fix this problem. Damage to dish racks doesn’t have to mean replacing your dishwasher. And, with these easy fixes, it doesn’t even have to mean replacing the racks. 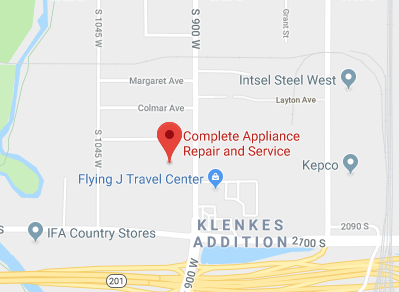 If you would rather not worry about it, consider calling Complete Appliance Repair. Serving Bountiful, Utah, and the entire Salt Lake City area, their experienced technicians can give you an honest evaluation of your dishwasher’s condition and provide all the repairs necessary to restore its full operation. Contact them today for help with your dishwasher rack troubles. This entry was posted in Blog and tagged Dishwasher rack tips, DIY dishwasher repair on September 9, 2015 by admin.